Suna Qasim, Marketing / Fundraising Officer with the Asthma and Allergy Foundation, Pitmedden Road, Dyce, Aberdeen, the only charity of this kind in Scotland. Being exposed to smoking, dust, pollen and grass can all cause Suna Qasim to lose her breath, and it is a daily challenge to avoid them to prevent a trip to hospital. Stressful situations can also bring on an asthma attack, and her inhaler is a constant companion as she tries to balance her condition with having the sort of normal life others in their early 20s enjoy. The 23-year-old has been affected by crippling allergic asthma since her childhood, which has often caused panic-stricken trips to A&E. But Miss Qasim has managed to turn the negatives in her life into a positive for others, as she uses her experiences to educate others about how best to handle their own allergies. 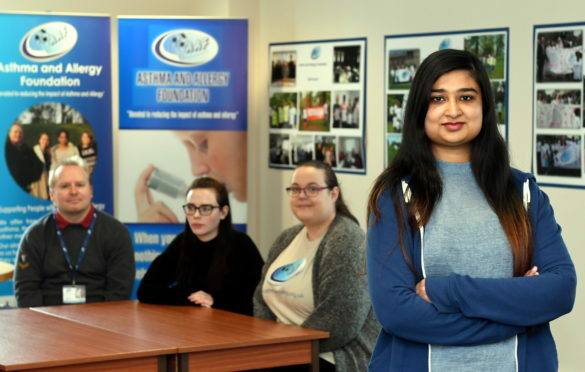 She is now a part-time member of staff at the Aberdeen Asthma and Allergy Foundation, which is the only charity of its kind in Scotland and last year opened its own base at Dyce. And one of her most important jobs is performing presentations at sheltered housing complexes, to help older people live more comfortably with their conditions. She said: “I remember my childhood was really bad, I was off school a lot and missed activities because of my asthma. “Some children still see asthma as a stigma, so we are taking a new awareness programme around schools to to educate them about triggers and how to avoid them. Miss Qasim graduated from Aberdeen University with a degree in business management in September, and found her calling when she began volunteering as a marketing officer with the charity two months later. Asthma affects more than 35,000 people in the NHS Grampian area. North East MSP, Lewis Macdonald, is a keen supporter of the Aberdeen Asthma and Allergy Foundation and helped open its centre last year.